Fad diets, celebrity-approved fitness routines, and media-hyped workouts are constantly touting their supposedly fail-proof ways to help you stay healthy. It’s kids, though, who can really show us the secret to staying fit: having fun. If you can find ways to make your exercise so much fun that you forget you’re exercising, you’ll stay active and healthy without even trying. In fact, a recent study found that having fun while staying active, instead of just doing your requisite exercise, can even help you eat less. Changing your mindset about exercise will help you control what you eat more effectively. In a study conducted at the Cornell Food and Brand Lab, which actually involved two smaller studies, researchers led adults on a walk around a lake. In the first study, the people involved were given lunch after the walk. The group that was told it was an exercise walk ate 35% more chocolate pudding than the group that had been told it was a scenic walk. In the next study, the exercise walk group ate more than twice as many M&Ms as the scenic walk group. Part of the reason for this is the tendency to reward yourself after exercise. Maybe you bribed yourself to do that last set of reps by thinking of the brownie waiting in the break room, or maybe by the time dinner rolls around, you unconsciously scoop yourself a bigger bowl of ice cream to reward yourself for the jog you took earlier. If you approach your exercise as something fun, instead of as something you just have to do, you’ll end up in a better mood. That good mood can translate into a willingness to eat less and do more exercise. Also, don’t worry about finding a way to work in a long stretch of exercise. It’s well-established that exercise can be cumulative, so three 10-minute spurts of exercise are just as effective as one 30-minute workout. One recent study suggests that shorter bursts of exercise may be even more effective than longer exercise sessions. Research published in Diabetologia, which is the journal of the European Association for the Study of Diabetes, found that short bursts of intense exercise are better at controlling blood sugar levels than a single, longer session of moderate exercise. The bursts of exercise were conducted immediately before meals, and the participants saw serious reductions in post-meal blood sugar spikes. Traditional, continuous 30-minute sessions of moderate exercise, on the other hand, didn’t improve control of blood sugar levels. One easy way to make exercise fun is to make it a social event. There are two big benefits to exercising with a friend. First, it keeps you accountable. If you know your friend is waiting at the park or gym, you’ll be less likely to talk yourself out of your workout. Second, chatting with a friend distracts you. Instead of focusing on how many steps or minutes or reps you have left, you’ll hopefully be so caught up in your conversation that the time flies and you’ve finished your exercise without realizing it. Walking, jogging, swimming, and biking are popular exercises to do with a friend. If you’ve got a competitive streak, consider having a friendly contest. Race up and down the length of the swimming pool, or play a game of one-on-one basketball or racquetball. You can also join a local sports league. Some community centers even offer senior or disabled leagues. If you can’t find a senior or disabled league near you, talk to whoever’s in charge and get one started. It’s a great way to make friends while exercising. If you’re just starting out on an exercise plan, though, it’s probably a good idea to work out on your own before you sign up. That way you can figure out your abilities and limitations. You can also look for classes that don’t cover the typical types of exercise. Some exercise classes, like ballroom dancing or fencing, are especially fun when done with a friend, spouse, or partner. Even if you’re going it alone, though, classes like these are an excellent way to keep yourself happy and invested. However, don’t forget to be a little cautious when you’re trying a new activity. Consider calling the class instructor to discuss your pain condition and any physical limitations. This will allow the instructor to let you know if that particular activity is a good match for you, as well as suggest possible modifications to some activities. Technology can make exercise fun, too. Video games are becoming an increasingly popular way to exercise. Games that focus on fitness, sometimes termed “exergames,” are fun, customizable, and easy to do at home. Additionally, purchasing a gaming console like a Wii or XBOX 360, plus a few games and add-ons, will definitely add up, but it’s a one-time purchase that will likely cost less than most annual gym memberships. To get an idea of the best exercise-centric video games, check out this slideshow of the Top 10 Fitness Video Games from CBS News. However, you don’t necessarily have to have a fancy game console to have fun with technology. There are also an increasing number of fitness-focused apps for smartphones, some of which are cleverly disguised as games. For example, one of these apps is a racing game. You open the app and place your device on your stationary bicycle, and it senses the vibration of the bike to calculate your race car’s speed. The faster you pedal, the better you do in the game. If you’re at a loss, do what you loved doing when you were a kid. If the word “exercise” makes you cringe, then forget about exercising. Set aside some time to play each day. 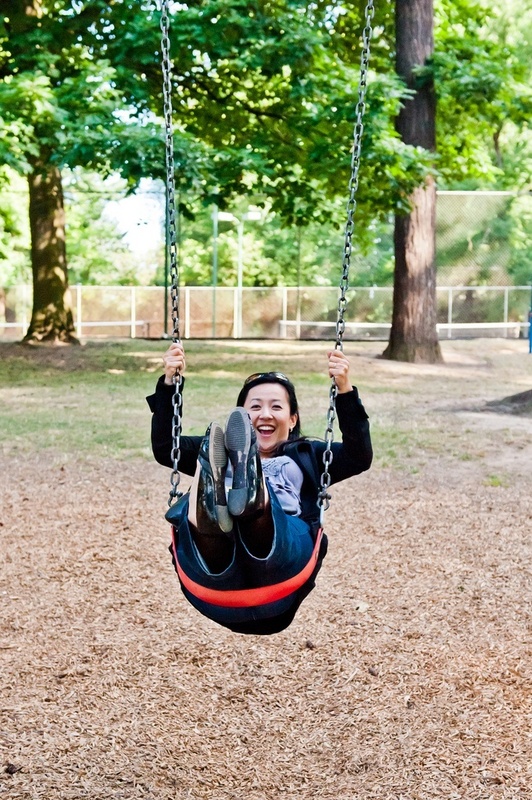 Go to the park and play on the swings. Get a jump rope or hula hoop. Bounce around on a trampoline. Take the kids to the park, and play on the jungle gym with them. You’ll be a hero for taking them on an outing, and you’ll get some activity in for yourself, too. Crank the music up while you’re doing chores, and sing and dance to make the time go faster. How do you have fun while exercising?